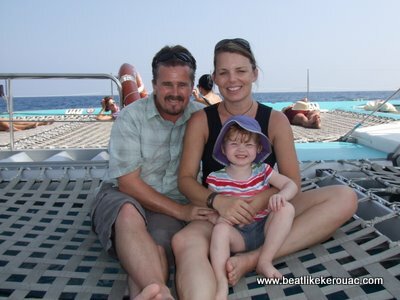 How to Enjoy Yourself in Barcelona – With a Two Year Old | Beat Like Kerouac – now with child! Cruising on 'The Med" on a Catamaran! Ah Barcelona, where have you been? What excuses have I concocted in not having visited you for so long? 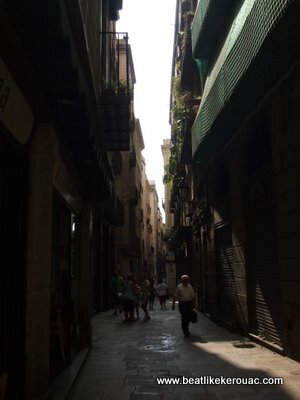 This is not a post about the Ramblas, not a post about how Barcelona has become an International City since the 1992 Olympics, it’s about two souls running parallel for a moment, the method of travel?.… improvisation (with a two year old – apologies for the “Motorcycle Diaries” rip-off). The two souls, myself and the city (Ash and Lily were there as well) danced the flamenco deep in the Barri Gòtic while a street musician played his heart out, and was awarded with a couple of Euro for his efforts. All this hyperbole is my way of introducing our week in this wonderful Mediterranean city. This is not a complete account of what should be, can be, accomplished in one week here. It’s just what we did, and what we found important. Visit La Boqueria. This market right off the Rambas should be any erstwhile visitor’s first stop. Jamon iberico, chorizo sausage, good artisanal cheese, seafood still flipping on the table, fresh bread, pastries and traditional favorites (like blood sausage- yummy) abound. 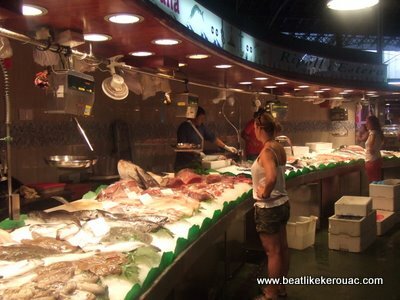 Each morning we visited the market with an eye towards our evening meal. The siren song of Barcelona’s restaurants has not been our calling, especially with a toddler, but each evening after Lily has gone to bed, we have feasted in our apartment on traditional Catalan staples washed down with good red wine. It is hard to envy those sitting at a table and paying a premium for what we bought at the market for a pittance. Get lost in the Barri Gòtic. Barcelona’s medieval quarter is the stuff that fairy tales are made of. The network of wandering streets has more twists and turns than a politician’s resume. Looking down them from a major avenue (like the Ramblas) they practically speak, calling to you and saying, “Come on, take a stroll down here. You might find that little Tapas place you’ve been looking for, or a quiet square with a 14th Century fountain. I promise that the guy smoking pot and dipping his feet in the water won’t bother you.” Sometimes, if you are careful, and squint your eyes just right, you might witness a scene that has not changed since 1425. Visit a building designed by Antoni Gaudi. Barcelona’s boy-from-home-made-good is a major draw-card for visitors, and it is easy to see why. Seeing a Gaudi building for the first time elicits a, “what the….” from even the most jaded of architecture-ophiles. Flowing lines drawn directly from Gaudi’s interest in nature are the dominate feature on all his later works. We visited Casa Milà, Casa Batillò and the grand-daddy of them all Sagrada Famìlia. Still under construction after 130 years (and with at least 30 more to go) this Catholic Church is a site to behold. Once finished it will have eighteen spires with the largest topping out at 550 feet. This unfinished work is a testament to Gaudi’s Catholicism, and if anything could ever make me believe in an omnipotent force governing all of us, this man’s efforts to depict it would have to come close. Pay homage to Picasso. Having spent his formative years here in Barcelona, “The Spaniard” never let a trivial thing like fascist rule get in the way of the establishment of a museum. Even after vowing never to set foot in Franco Spain, Picasso continued to send material to a museum dedicated to his early works, although he missed the opportunity to visit it himself… probably too many young French women to sleep with. The Picasso museum is a “how can I come to Barcelona and not visit it?” kind of place, and gives a wonderful depiction of the artist’s early development, before he lost himself to cubism (which I happen to think very highly of) and led to my father commenting in the National Gallery of Victoria, “Is that all? Someone actually stole that? My two daughters could finger paint better than that.” Bless you Dad! Stay in a vibrant neighborhood. 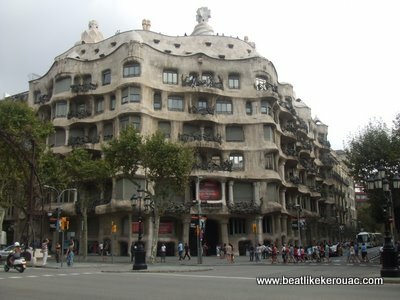 Avoid the hotels in tourist areas and find an apartment in Barcelonetta. Staggering up four flights of stairs with our stroller each day (while clearly an effort) has been worth it. As depicted in a previous post this neighborhood is a veritable plethora (a cornucopia if-you-will) of eateries, bars, local housing, cafes and beaches. Streets are really not meant for cars here, but for walking. The Mediterranean is only 30 seconds from our front door (although it takes five minutes to negotiate the four flights of narrow steps). Each afternoon, after being marketed, churched, building-ed, tapas-ed and art-ed out we have retreated to “The Med”, waded out past the Russians in their banana hammocks, Germans in their bike-short swim trunks, Spanish in their stylish togs and French in almost nothing at all, to the cool water and looked back to the colorful buildings and said, this is our home in Barcelona. 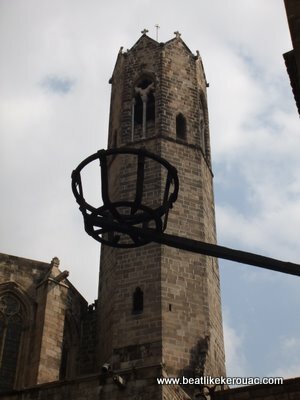 Gallery | This entry was posted in Spain, Travel and tagged barcelona, Spain, travel. Bookmark the permalink.